Around 15 years ago, when the concept of “Knowledge Economy” was increasingly being talked about and becoming mainstream, I had the opportunity to commission Thota Tharani a renowned artist from Chennai to do a series of paintings on Lakshmi & Saraswati. 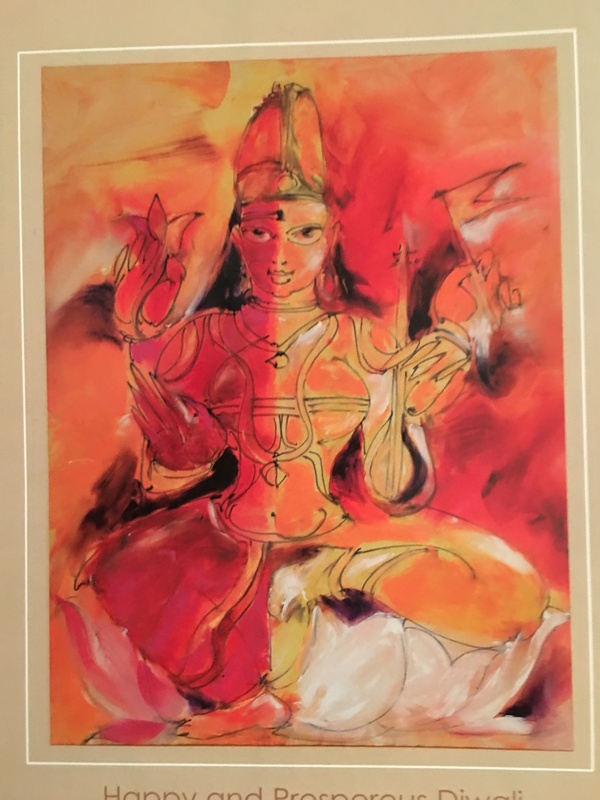 One of the paintings I had requested him to do was to fuse both Lakshmi & Saraswati into one single image.Using a combination of colours ( maroon for Lakshmi, yellow for Saraswati and adornments unique to each deity), he came with this beautiful image. My alma mater was also involved in providing advise as well funds, so the painting described our service offerings succinctly and found its pride of place in the office reception. Over the years having re invented myself into different avataars in my profession, I find that not only is value (Lakshmi) created from knowledge (Saraswati), one has to constantly learn new skills and upgrade the existing ones in order to create anew or even sustain the value so created. Imagine yourself as unit of enterprise with Diwali as your accounting year and reflect on your capabilities and core competencies that brought you to where you are today. Ask yourself : How is the market evolving? What are the emerging trends? What kind of capabilities are sought after? What are my current skill sets? What is the gap? In other words resort to Fair Value Accounting and mark to market your current skills and capabilities. Do not resort to Historical Cost Accounting and rest on your past laurels ! Mercilessly write down your capabilities and determine the gap and start working on building them afresh. Learn, re- learn. In other words seek the blessings of Saraswati on the day world is celebrating Lakshmi ! Having given that sagely advice, I must admit that this is not so easy if you hit the fifties ! As an entrepreneur, through the 30s and 40s I could successfully morph myself from one role to another, but having reached early fifties, it is getting increasingly difficult to re invent myself. I guess I need to pray harder to Saraswati. Yesterday in CNBC Awaz, Mr.Devadatta Pattanaik was making almost similar points. For one to be successful in life, one has to invite all the three goddesses into our lives. Saraswati with the knowledge, Durga with power and confidence and Lakshmi with wealth. First step is to mentally prepare to receive all the three. Focusing on only one is incomplete. One should strive for knowledge, one should be comfortable to use our personal influence and one should be comfortable to receive wealth. Many people are not. Many are scared of wealth. Finally as Paulo Coelho mentioned in one of his books, the most important aspect of receiving wealth is to be clear why we want wealth. Is it to accumulate? Is it to feel safe? Is it to help society? Unless we are clear of this, no wealth will come to us.